Lindsay Art Trail | Business & Tourism Creswick Inc. The Lindsay family is considered one of Australia's most important artistic families. The Lindsay children were born and raised in Creswick in the late 1800s and early 1900s and continued to have connections with the town until Mary's death in 1968. 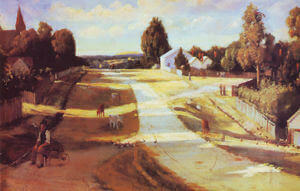 There are consistent references to the Lindsay's childhood home town in both the visual art and literature produced by the Lindsay siblings throughout their careers. Click here for more information about the family. The Creswick of the Lindsays Arts Trail comprises 24 sites weaving through 7.6 kms of the town, and includes the Creswick cemetery where seven members of the family lie. The content focuses on the relationship of the Lindsay children to Creswick and highlights the sites and buildings that have significance to the Lindsay family. Each sign is built of material chosen for its durability and aesthetics and with three amazing glass panels which feature paintings by Norman Lindsay. Each site provides a description explaining why the site is important to the family. Many include QR codes allowing you to access further information on your mobile device. The best place to start the Trail is at the Visitor Information Centre at the corner of Albert and Victoria Streets, where the Arts Trail Visitors Guide is available, although you can join the Trail at any site you choose. Please click here to download a PDF of the Trail Guide. The Guide contains a map, with each site numbered from 1 to 24. Most can be reached with an easy walk but some such as the cemetery, are best visited by car. However you choose to travel, enjoy the journey. Concepts for the Lindsay Trail were developed by Business & Tourism Creswick Inc who raised over $44,000 within the Creswick community through dinners, festivals, raffles and other events to produce a masterplan for the Trail and investment in its infrastructure. The Trail was adopted as a project of Hepburn Shire Council and has received funding from Council, Business & Tourism Creswick and the Advancing Country Towns project sponsored by the Department of Regional Development Victoria. Stage one of four stages of the Magic Pudding Playground was installed some years ago and is a site on the Lindsay trail. Hepburn Shire Council is working towards building the next stages which will provide more enjoyment for children and further enhance of the Trail as an attraction suitable for all age groups.